Communication Objectives: Using vegetable vocabulary, children will learn how to find vegetables in a shop using English. Language Objectives: This lesson teaches how to ask the price of things using the phrase “how much?”. It uses kilograms of vegetables to teach measurements. 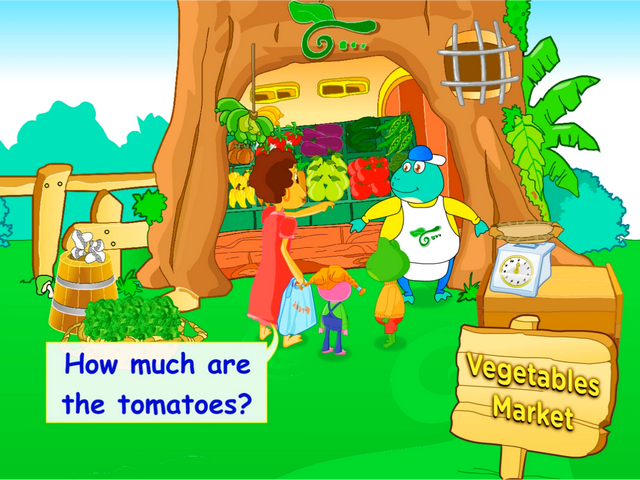 Dialogue Story: Mom takes Freddie and Lisa to the vegetable market so they can buy different vegetables to take home. They ask about various vegetables. Freddie and Lisa fight over who carries the shopping bag home.